To design and manage a remodeling project is no easier than building a house of cards: one wrong move and all your work comes crashing down. This is especially true for managing deadlines. In this article we have picked up 4 main things that can threaten delivering on time as well as ways to fight them off. The cornerstone of not hitting the deadline for design project is miscommunication. There are many reasons this may arise: client inexperience, perhaps expectations are not in line with one another or simply someone involved is changing their mind every couple of days. Regardless, the more times you have to edit and revise the project, the harder it is to keep the momentum moving forward rather than back. If you feel that your client will be difficult, just make sure to explicitly state in your contract how many amendments/revisions are included and what would be considered extra. This will make things move along faster with a lower likelihood of extending project timelines and deliverables. Your time is as important as there’s and extra work being asked of you should be justly compensated for. Also be mindful of pointing out any items or decisions along the way which can affect the deadline that has been already discussed… in writing preferably so there is a record. There’s a triple constraint for any project, which consists of Quality, Time and Cost. One side of the triangle cannot be changed without affecting the others. In order to hit that deadline, you have to make sure your costs are fixed, otherwise your quality will be impacted instead. Contingency. Always make sure a contingency cost is set aside based on the project scope and size in the very beginning to act as a buffer when these problems arise…because they will. A contingency of 15% is an average place to start for a medium complex project. Logistical issues are another pain for any designer or project manager. When working on an interior design project, we often aim for unique materials or décor elements, which are sometimes hard to find. Though they are great for adding exquisite vibe to the design, some vendors can let you down with the delivery time, which can be death for hitting those deadlines. Goods can be lost, damaged or simply the wrong color – hard to find a designer, who’s never had problems like this. You can never protect yourself from unreliable vendors, contractors or some shipping troubles. But what you can do, is to order the required products as soon as possible and make sure you added some time in the deadline, if something will go wrong. This way you will always be ready for whatever happens and will be able to tackle arising issues with a cool head. And finally, nothing can be worse for meeting the deadline, than having an unclear specification. We understand that making up a spec is not the easiest thing in the world. But having to have part of work redone, just because the document didn’t have something specified or even had wrong information is the worst thing that can happen to a project. Instead of doing all the specification by yourself, use a professional software designed specifically for your needs. Fohlio is an online tool that brought specification management to a new level. 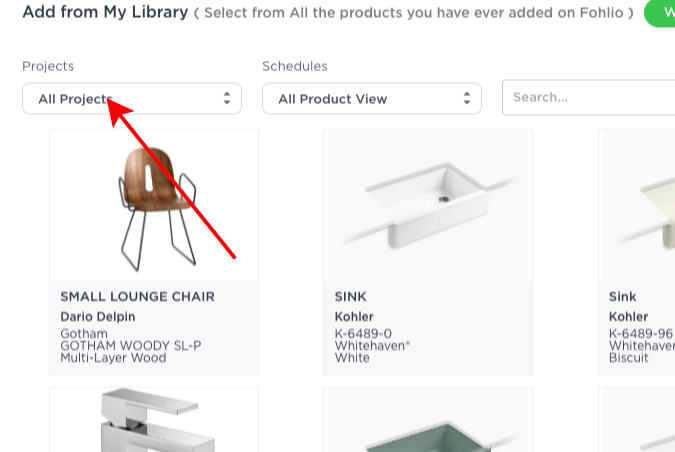 It allows you pin products and data about it from all over the Internet, organize it with handy folders, share with clients and export whatever information in different formats. Fohlio is great for both discussing different options and preparing the final project specification. It significantly reduces the amount of manual work designer has to do and lets you focus on what is really important. Hopefully, now you are ready to tackle any interior project deadline. And how do you deal with the issues described? Share with us in the comments!